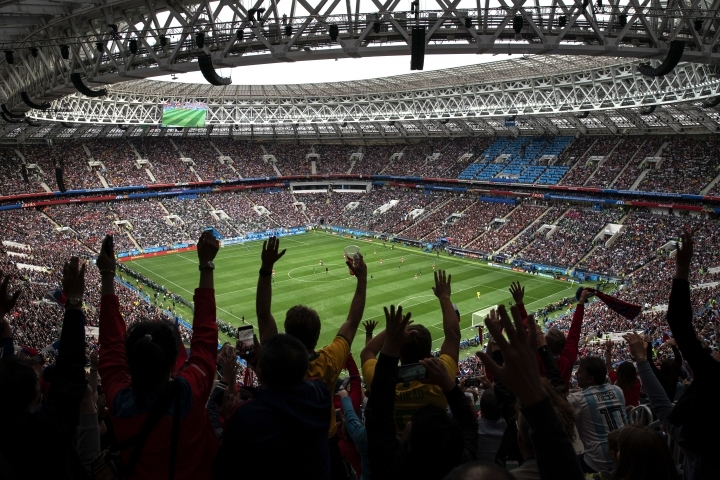 SAO PAULO — Some Latin American fans at the World Cup are receiving strong criticism for sexist behavior and could even face workplace consequences for posting videos in which they encourage foreign women to say offensive things in languages they don't appear to understand. In one of a handful of videos, a group of Brazilian men surround a woman and encourage her to chant with them in Portuguese an offensive word for female anatomy. In another, Colombian fans encourage a woman to repeat offensive things about herself in Spanish. In yet another, fans from Mexico hold a woman up in the air and urge her to use a slang word for a female body part in Spanish. As the videos were shared widely on social media and published by media outlets, some of the Brazilian men were identified, and their employers expressed dismay, promising consequences in some cases. While sexist and offensive behavior was long considered almost inevitable at large sporting events, changing mores and especially increasing awareness of sexual harassment and assault in the wake of the #metoo movement has reduced tolerance for it. For instance, FIFA opened disciplinary proceedings against Mexico after its fans used an anti-gay slur during the team's World Cup win over Germany. Condemnation of the videos came from many quarters, with some lamenting that they had been published at all and others noting that the strong reaction showed that at least this sort of behavior is losing ground. Colombia's Foreign Ministry tweeted Tuesday that such behavior "not only degrades the woman, but insults other cultures, our language and our country." For several hours, the ministry pinned the tweet to the top of its feed so it would be the first one read, a sign it considered the matter important. Several in Brazil expressed embarrassment that the behavior of some was tarnishing the country's image, but also acknowledged the actions reflect a worrying strain in Brazilian culture. Leandro Cruz, Brazil's minister of sports, told journalists in Moscow on Wednesday that the men were "doing an immense disservice to Brazil." Brazil's National Council of Women's Rights said in a statement that the behavior "is evidence of the reality of physical, verbal, psychological and moral aggression that many women often face in Brazil and in the world." One of the men in a video of Brazilian fans apologized for his actions when contacted by the UOL news agency. But he also said too much was being made of the incident, calling it a joke gone awry amid a party atmosphere and too much alcohol. "We are fathers, workers, and you're ending our lives," the agency quoted Luciano Gil, who said he has a daughter, as saying. "I apologize to women who might have felt offended, but this is becoming a tempest in a teapot." Brazil's military police post in Santa Catarina confirmed that one of the men in one of the videos was an officer in that southern state and said it would open an administrative disciplinary proceeding to look into his behavior when he returned from Russia. LATAM Airlines Brazil confirmed one of its staff members was in a video and said it had taken "appropriate measures, in line with its code of ethics and behavior." It would not say what those measures were. The Bar Association of the state of Pernambuco, meanwhile, said one of the men was a lawyer. It criticized one of the videos and noted that Brazil ranks fifth in the world in violence against women, according to the United Nations, and that Brazilian women are frequently subjected to physical and verbal harassment and assault. "The statistics are alarming and lead us to a deep reflection on the need for an urgent change in the macho and patriarchal culture that is still, unfortunately, a part of our society," the association said. Tiago Fernandes, a professor who took to Twitter to criticize the behavior, said he wasn't surprised by it but that he thought Brazil is beginning to change. "This kind of behavior always existed but never generated this kind of reaction," said Fernandes, who lives in the northeastern city of Recife. Associated Press writer Mauricio Savarese in Saransk, Russia, contributed to this report.